Help name Prince George's County's new pink ambulance! Officials are taking suggestions through Twitter, Facebook and email through the end of July. 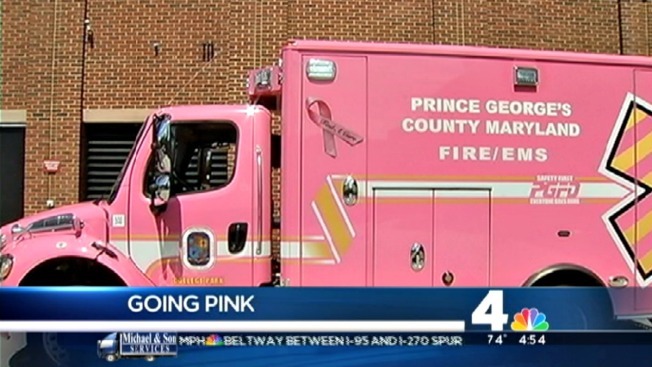 Prince George's County officials are asking for the public's help in naming a new ambulance that's painted pink. The new ambulance -- painted pink to promote breast cancer awareness -- went into service Sunday. It will be based at a station near the University of Maryland in College Park. Officials say they're taking suggestions through Twitter, Facebook and email through the end of July. The person who submits the winning nickname will get a pink uniform shirt of the type worn by Prince George's County medics during October, which is National Breast Cancer Awareness Month. The ambulance isn't the only pink vehicle in the county. Officials also have a pink fire truck called the Pink Pumper, or "Pinky."